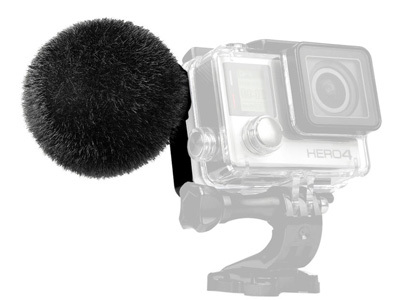 The MKE2 Elements Microphone for GoPro HERO4 Action Cameras from Sennheiser is the result of the GoPro and Sennheiser collaboration to create a high-quality microphone, and an innovative wind protector for capturing audio with the HERO4 camera. It can be used to deliver a high-quality audio signal to the camera for videographers even in extreme conditions such as in wind, water, snow, dust, and mud. The omnidirectional microphone has a water protection rating of IPX7, which is submersible to a few feet, and a frequency response of 20 Hz to 20 kHz. A professional Sennheiser capsule inside the windshield delivers audio to the GoPro HERO4 connector. The microphone is attached to a back door which replaces the original HERO4 back door of the protective housing. It is built with the GoPro connection for the HERO4. Additionally, the Sennheiser MKE2 element has been approved by GoPro and received the "Works with GoPro" approval.